Urban Archeologist: Go See the Flagpole Radio Cafe this Weekend! 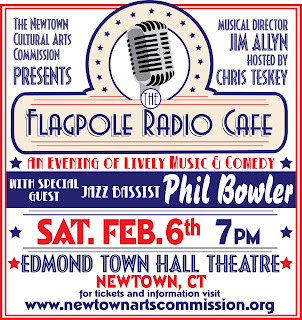 Go See the Flagpole Radio Cafe this Weekend! There are lots of reasons to go the the Flagpole Radio Cafe this Saturday, the least of which being that one of my bits was accepted and will be performed by the Cafe Players. However, there are several better reasons. The special guest, Phil Bowler is an essential for Jazz lovers for his skill and for the people he's performed with see a clip of him performing here with a solo at about the 4 minute mark. Other reasons for going would be that it's a good night out, nearby, and you are supporting the arts, locally. You can see ticket prices and more information here. My gift to you....Chinese spammers!